What’s rock and roll without someone smashing their guitar at the end of the performance? If an inventor in New Zealand has his way, future guitars will be indestructible. Oh yes, and they’ll be 3D printed to your exact specifications. “You could throw one against the wall without worrying about it breaking,” said Diegel, who will begin selling the guitars online at the end of June. Their robustness might be music to a band manager’s ears. But perhaps more notable is how Diegel makes the instruments, which are attracting interest from around the world. Diegel is an exponent of 3D printing. 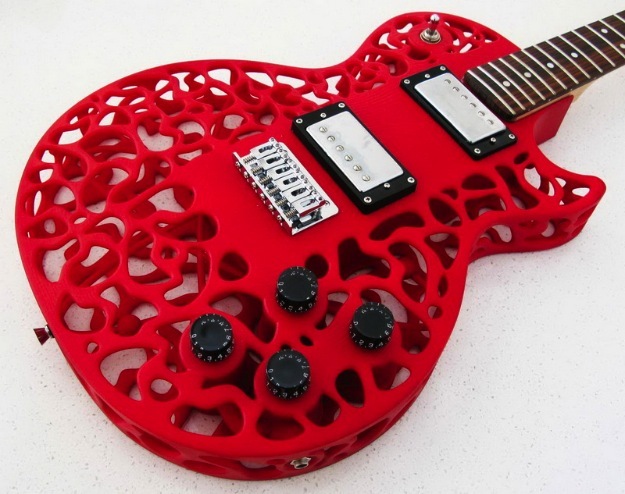 His zany guitar bodies are created using computer-aided design (CAD) software, output in one piece on an EOS 3D printer. This is the new world of additive manufacturing.